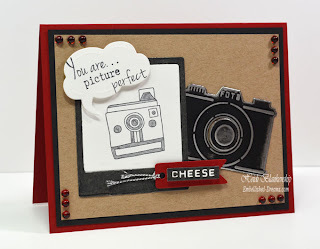 Hi- Today's post features our Glueista Heidi Blankenship! I just love the use of color with these fun simple black and white designs we now have in The Rubber Cafe'! Read-on and be inspired!! 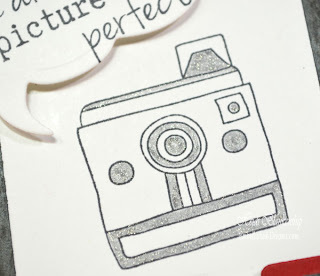 For the cute little camera image and the sentiment I used the Picture Perfect stamp set from The Rubber Cafe`. The card came together really quick and easy with a few layers of cardstock, stamps and die cuts. I used die templates from Spellbinders Creative Arts™, and used Royal & Langnickel Silver Engraving Art Foil for the camera die cut and lightly sanded the paper to reveal the silver foil. I love how the camera turned out! The only coloring that I did was to add a little sparkle to the stamped image of the camera using a Spica Silver Glitter Pen. For the snapshot and little word block I used letter press technique (or maybe you have heard it called Reverse Stencil) with Versa Magic Midnight Black in from Imagine Craft/Tsukineko. If you have never done the letter press technique it is really easy--put the die template on a piece of scratch paper with the cut side (ridges) face up, press the ink pad in to the die template giving it a good coverage of ink. Then carefully pick up the die template and place it face down on the paper you want to cut and then die cut the image. The ink can get a little messy so I usually put a sheet of printer paper down on my mat, then the die template and cardstock and then fold over the printer paper. When you do this both sides of the die template will be covered and you won't get ink on your mats. Once you are done you can use a baby wipe to remove the ink or wash it with soap and water. The best ink to use for this technique is a craft ink--like a pigment or chalk ink--something that won't dry too quick. To finish off the card I added a few Holly Berry Red Jellie Dots, that I adhered to my card with Scrap Happy Sheer Glue and my Stick "EM" Up Tool all products from The Rubber Cafe`! 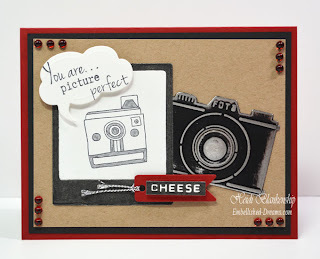 I love how this turned out - but has that look love the dimension the diecut gives to the black/white stamped image.